At Schmucker Lumber and Metal, we realize your buildings require individual and unique attention. That’s why we listen to your needs first, and then design a building based on your specifications. We have a computer program to give you a detailed design and layout of your building. We can build any size garage/workshop from single car garages to buildings large enough to store your large motor home or semi-truck. Whether your needs are for Agricultural Buildings; Commercial Buildings; Garages; Workshops; Residential Roofs or Siding or if you need lining and insulation for a heated building, we can do that also. We specialize in Custom Trims. Slit coils and flat sheets are also available. We pride ourselves in dependability and strive to meet the demands and interest of our customers in fast service and high quality products. Turn around for most metal orders are from one to two days. 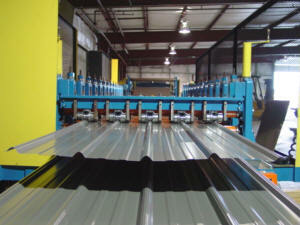 We are able to control production and quality by rollforming our products from coil stock to finished product. 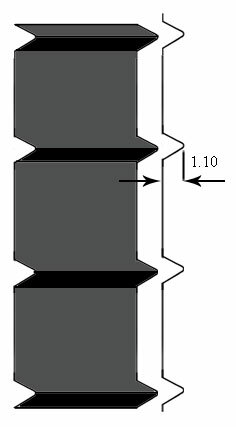 Panels are cut to length (from 12″- 42′). Exposed Panel Products: Available in 29g or 26g. • R-Panel is also available and it’s multi-use wall and roof panel is an excellent choice in pre-engineered metal building applications. R-Panel has 1.25″ high ribs spaced 12″ on center with a 38″ overall width. Class 90-Uplift test and Class 4 Impact Resistance. • Classic Rib is the newest line of roll forming designs added to make your house look like standing seam but only fractions of the cost. The Classic Rib panel line is ideal for residential housing. Classic Rib has 1.125” v- shaped ribs spaced 11” on center with a 34.5” overall coverage. Post Frame & Stud Wall Construction: Schmucker Lumber specializes in Post Frame and Stud Wall building construction. We can also provide turn-key for your building. Contact Us today for more information. Give us a call and we will assist you in a relationship you can build on. Garages & Workshops: Erecting an outside workshop and moving your hobbies out of the basement is a very good idea. Garages and workshops are affordable and easy to erect. If you are a bit handy and choose to assemble the building yourself, you will save even more money. You may be surprised how inexpensive a garage is. A garage makes perfect sense when your automobiles are important to you. Rather than allowing the weather take its toll on your vehicles, you may consider a garage to be a great investment for your car and property. Residential Roofing: Metal Roofing has some distinct advantages over a standard shingle roof. You have a variety of colors to choose from so you can be sure to find the perfect color to enhance your existing structure. Resulting in a maintenance-free and energy efficient roof for many years to come. Agricultural Buildings: Farmers and cattle-raisers all over the country are using buildings for a wide range of tasks. They use them for just about everything from equipment sheds to large livestock facilities. Ag buildings go up fast and are very economical-From a three sided animal shelter to a fully lined and insulated building- we can do it all. Pole Buildings / Machine / Hay / Grain Sheds: One of the oldest building techniques, Pole building has gained popularity for its strength, simplicity and cost. In addition, modern materials like pressure-treated poles, fasteners, and other building materials are developed to make pole construction even more durable. We will custom design a pole barn to fit your equipment and growth plan. We know an Ag farmers equipment investment is what keeps things rolling on the farm and that’s why we work hard to design a building that fits both your needs and your budget. Storage / Tool Sheds: Whether you need a shed for a work area, to store gardening tools, or just to throw the bikes in to clean-up the yard, it’s a great way to get organized. A world class equestrian center and a backyard round pen both share a common trait- that is only a small portion of what is necessary to build a safe, long lasting , enjoyable riding area. Our horse barns and facilities are built custom to suit your design ideas. We will work closely with you to design your dream horse barn, riding arena, shelter and storage facilities for you equestrian facility. Equestrian Arenas / Stables / Horse Barns: A world class equestrian center and a backyard round pen both share a common trait- that is only a small portion of what is necessary to build a safe, long lasting , enjoyable riding area. Our horse barns and facilities are built custom to suit your design ideas. We will work closely with you to design your dream horse barn, riding arena, shelter and storage facilities for your equestrian facility. Lean-To Buildings / Additions: Our lean to buildings fit right in because that is what they are designed to do. They’re made to interface seamlessly with conventional construction or with existing pre-engineered metal building systems. Our load-bearing walls and single-span roof system hold costs to a minimum and allow you to choose either metal interior liner systems or conventional drywall or plywood panels. Liner Panel: Interior walls of steel paneling that is excellent for finishing off the inside of your building. They are available in 29 gauge and typically white is the color choice which is then screwed into the wall and/or roof framing. Liner panels serve two purposes; they give the interior a finished look and they protect the insulation and exterior walls. You can customize your building with both color and different trims & flashings manufactured to exact specifications. No building project is complete until the finishing touches are applied. Take a look at our photo gallery to see examples of our finished buildings. QUESTIONS ABOUT BUILDING PACKAGES? CONTACT OUR EXPERTS TO HELP.